Ever wonder how a film wins awards? Take a close look at an alumnus's career in the entertainment industry and his role on the award-winning film "Call Me by Your Name." On Reductress.com , the satirical feminist website co-founded and co-edited by Sarah Pappalardo (CMN '07, LAS MA '08) , women are smart, savvy and fully aware of the media machine. DePaul partners with the Chicago Housing Authority to enable teens like these to make documentaries. Liliane Calfee, adjunct faculty, is in the center. Only about one in four people in the film industry in the United States is female. Yet, in the School of Cinematic Arts (SCA) in the College of Computing and Digital Media (CDM), 80 percent of the documentary courses are taught by women, and the MFA program is headed by a woman. 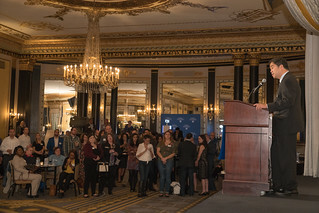 To see more photos from alumni events, visit the DePaul Spirit flickr photostream .